As always, we will appear on Mondays in Strathcona Park. The rest of the week we will perform in various parks in and around Ottawa. A finalized tour schedule will be published in late spring (once dates and locations are finalized and permits are acquired). Join us this summer in a park near you for this timeless tale of everyone’s favourite pair of star-crossed lovers. 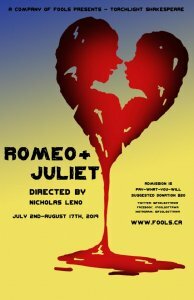 Presented in the Fools’ signature physical style, our riotous take on this timeless tragedy is sure to have you and your family rolling in the aisles! 2019 marks the 17th year that Torchlight Shakespeare has been bringing professional theatre to Ottawa neighbourhoods for pass-the-hat Pay-What-You-Will prices. Your sponsorship and donations help to support Torchlight and keep our admission cost accessible. Please consider making a tax deductible donation today! Donate here.